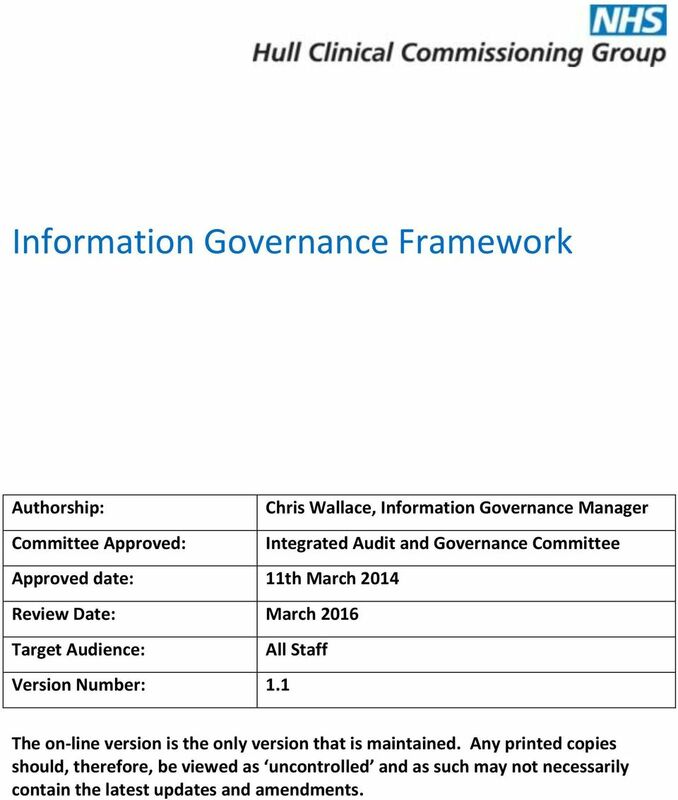 1 Information Governance Framework Authorship: Chris Wallace, Information Governance Manager Committee Approved: Integrated Audit and Governance Committee Approved date: 11th March 2014 Review Date: March 2016 Target Audience: All Staff Version Number: 1.1 The on-line version is the only version that is maintained. Any printed copies should, therefore, be viewed as uncontrolled and as such may not necessarily contain the latest updates and amendments. 3 employees to comply with the Policies, Procedures and Guidelines which are in place to implement this framework with the aim of ensuring thathull maintains high standards of IG. Information Governance Toolkit (IGT) Completion of the IGT is mandatory for all organisations connected to N3 the proprietary NHS computer network, for organisations using NHS Mail and providing NHS services. All organisations are required to score on all requirements at level 2 or 3 to be at a satisfactory level. Annual plans will be developed year on year from the IGT to achieve a satisfactory level in all requirements. As the IGT is a publically available assessment the scores of partner organisations will be used to assess their suitability to share information and to conduct business with. 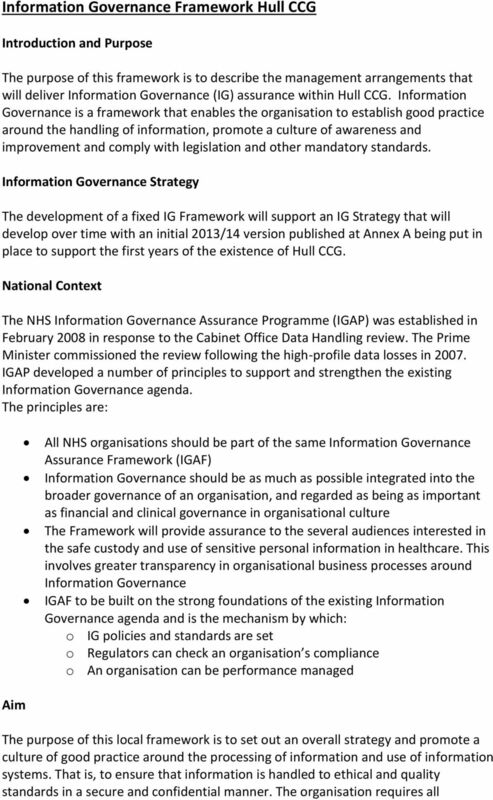 North Yorkshire & Humber Commissioning Support Unit (NYHCSU) Hull CCG has in place a service level agreement (SLA) agreement with NYHCSU to deliver a range of IG services including delivery of the IG Toolkit at Level 2. Caldicott Guardian The Caldicott Guardian for Hull CCG is the Director of Quality & Clinical Governance. The Caldicott Guardian is responsible for acting as a champion for data confidentiality and for developing their knowledge of confidentiality and data protection matters including links with external sources of advice and guidance to allow them to manage this subject area. They should ensure that confidentiality issues are appropriately reflected in organisational strategies, policies and working procedures for staff and oversee all arrangements, protocols and procedures where confidential information may be shared with external bodies including disclosures to other public sector agencies and other outside interests. 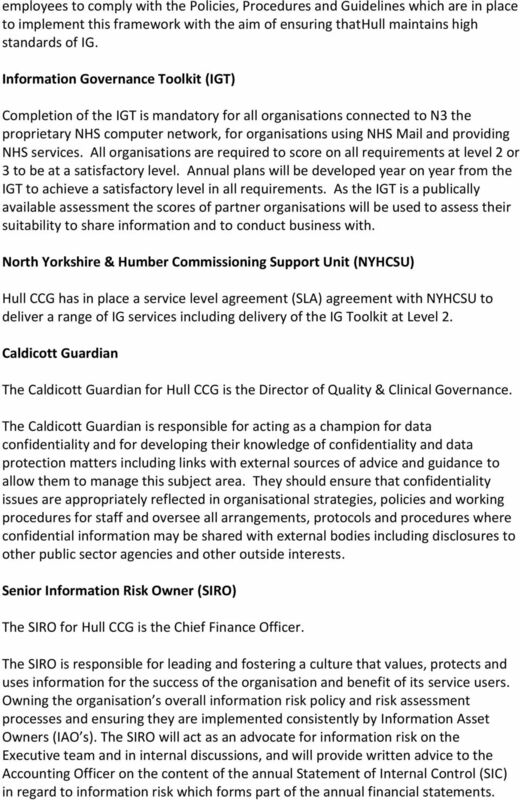 Senior Information Risk Owner (SIRO) The SIRO for Hull CCG is the Chief Finance Officer. The SIRO is responsible for leading and fostering a culture that values, protects and uses information for the success of the organisation and benefit of its service users. Owning the organisation s overall information risk policy and risk assessment processes and ensuring they are implemented consistently by Information Asset Owners (IAO s). The SIRO will act as an advocate for information risk on the Executive team and in internal discussions, and will provide written advice to the Accounting Officer on the content of the annual Statement of Internal Control (SIC) in regard to information risk which forms part of the annual financial statements. 4 Information Security With the increasing use of electronic data and ways of working which rely on the use of electronic information and communication systems to deliver services there is a need for professional advice and guidance on their use as well as the need to ensure that they are maintained and operated to the required standards in a safe and secure environment. Data Protection Act (DPA) The Data Protection Act is the most fundamental piece of legislation that underpins Information Governance. Hull CCG are registered with the Information Commissioners Office and will fully comply with all legal requirements of the Act. A process will be adopted to ensure that a review of all of new systems is carried out and where requirements such as the need for Privacy Impact Assessments (PIA) are highlighted these will be completed. Risk Management The ability to apply good risk management principles to IG is fundamental and all organisations will apply them through organisational policies. 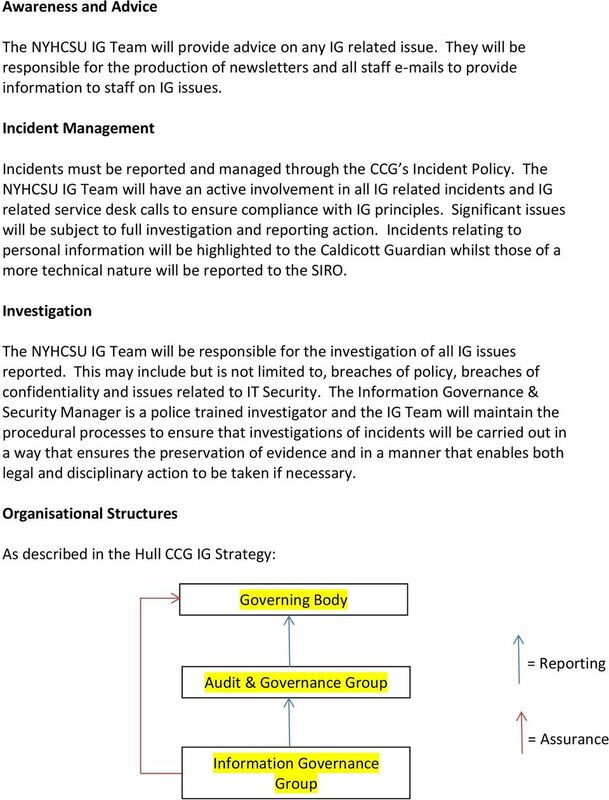 The NYHCSU IG Team will be responsible for completion of the risk assessments for any IG related issue, and have a specific remit to risk assess new technologies and recommend controls where necessary. Risk assessment will also be included as part of the Information Asset Owners role. Any information flows from or in to identified information assets will be risk assessed and the results reported to the CCG SIRO for risk mitigation, acceptance or transfer. 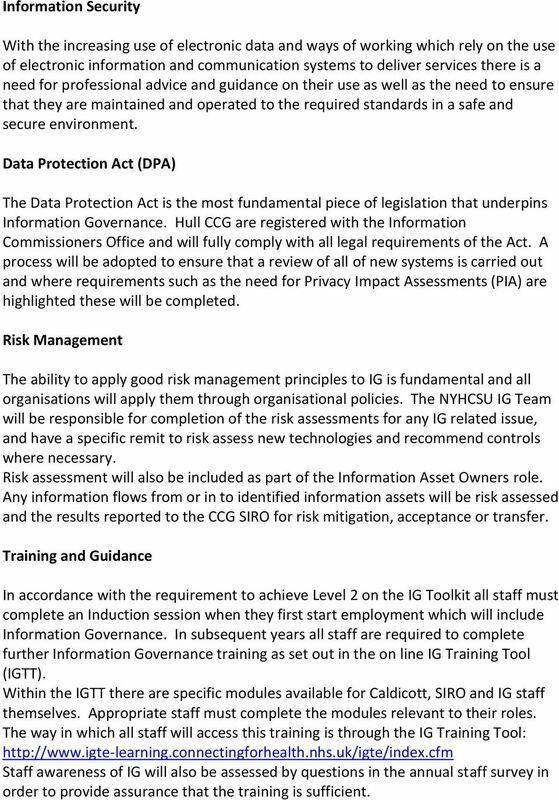 Training and Guidance In accordance with the requirement to achieve Level 2 on the IG Toolkit all staff must complete an Induction session when they first start employment which will include Information Governance. In subsequent years all staff are required to complete further Information Governance training as set out in the on line IG Training Tool (IGTT). Within the IGTT there are specific modules available for Caldicott, SIRO and IG staff themselves. Appropriate staff must complete the modules relevant to their roles. The way in which all staff will access this training is through the IG Training Tool: Staff awareness of IG will also be assessed by questions in the annual staff survey in order to provide assurance that the training is sufficient. 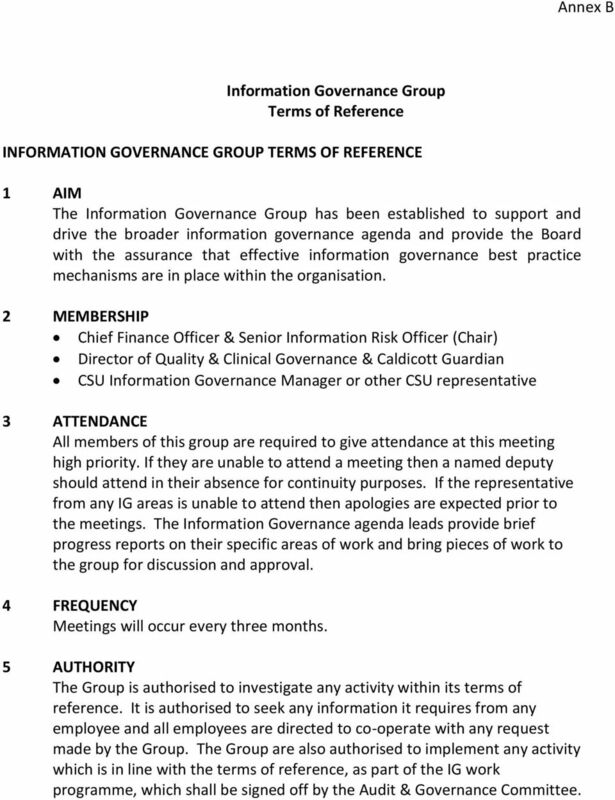 6 The Information Governance Group will be established to support and drive the broader information governance agenda and provide the Governing Body with the assurance that effective information governance best practice mechanisms are in place within the organisation. The Group will meet every three months and be attended by the SIRO and Caldicott Guardian and a representative of the CSU provided IG service. Other staff may be invited to the group where subject topics need specialist advice. See Annex B for the Terms of Reference for this group. 8 Supporting Policies and Guidance: Data Protection & Confidentiality Policy Confidentiality: Code of Conduct Policy Records Management policy Safe Haven Policy Mobile working policy Information Security Policy Bussiness Continuity and Strategy Policy Confidentiality Audit Policy Subject Access Request Policy Acceptable Computer Use Policy Policy IAO role and responsibilities Information Governance Checklist and Privacy Impact Assessment All of these documents are available on the CCG Internet site here. 9 Annex B Information Governance Group Terms of Reference INFORMATION GOVERNANCE GROUP TERMS OF REFERENCE 1 AIM The Information Governance Group has been established to support and drive the broader information governance agenda and provide the Board with the assurance that effective information governance best practice mechanisms are in place within the organisation. 2 MEMBERSHIP Chief Finance Officer & Senior Information Risk Officer (Chair) Director of Quality & Clinical Governance & Caldicott Guardian CSU Information Governance Manager or other CSU representative 3 ATTENDANCE All members of this group are required to give attendance at this meeting high priority. If they are unable to attend a meeting then a named deputy should attend in their absence for continuity purposes. If the representative from any IG areas is unable to attend then apologies are expected prior to the meetings. The Information Governance agenda leads provide brief progress reports on their specific areas of work and bring pieces of work to the group for discussion and approval. 4 FREQUENCY Meetings will occur every three months. 5 AUTHORITY The Group is authorised to investigate any activity within its terms of reference. It is authorised to seek any information it requires from any employee and all employees are directed to co-operate with any request made by the Group. The Group are also authorised to implement any activity which is in line with the terms of reference, as part of the IG work programme, which shall be signed off by the Audit & Governance Committee. 10 6 DUTIES 1.1 To ensure that an appropriate comprehensive information governance framework and systems are in place throughout the organisation in line with national standards. 1.2 To inform the review of the Organisation s management and accountability arrangements for Information Governance. 1.3 To develop an IG Framework and associated IG implementation strategy and/or maintain the status of the Framework. 1.4 To prepare the annual Information Governance assessment for sign off by the Audit and Governance Committee. 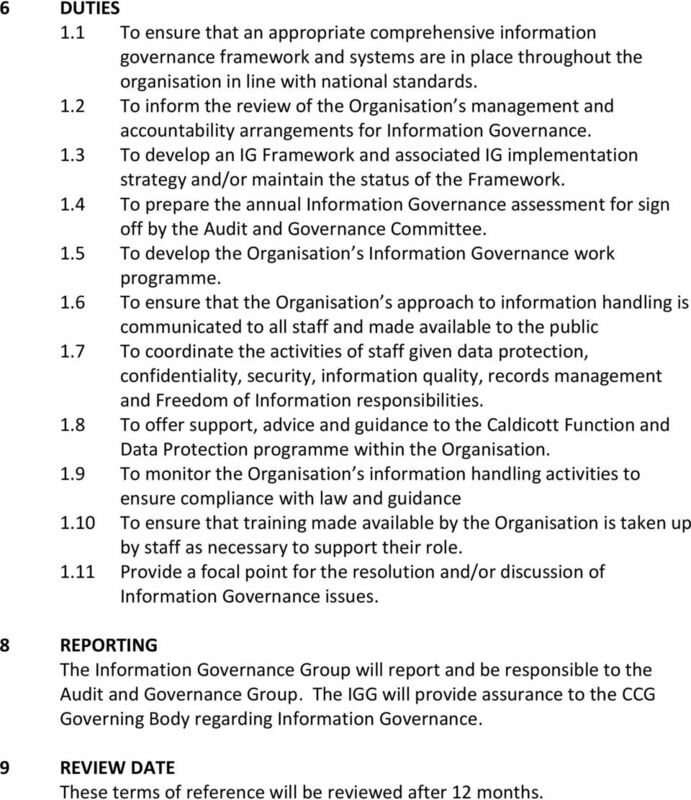 1.5 To develop the Organisation s Information Governance work programme. 1.6 To ensure that the Organisation s approach to information handling is communicated to all staff and made available to the public 1.7 To coordinate the activities of staff given data protection, confidentiality, security, information quality, records management and Freedom of Information responsibilities. 1.8 To offer support, advice and guidance to the Caldicott Function and Data Protection programme within the Organisation. 1.9 To monitor the Organisation s information handling activities to ensure compliance with law and guidance 1.10 To ensure that training made available by the Organisation is taken up by staff as necessary to support their role Provide a focal point for the resolution and/or discussion of Information Governance issues. 8 REPORTING The Information Governance Group will report and be responsible to the Audit and Governance Group. 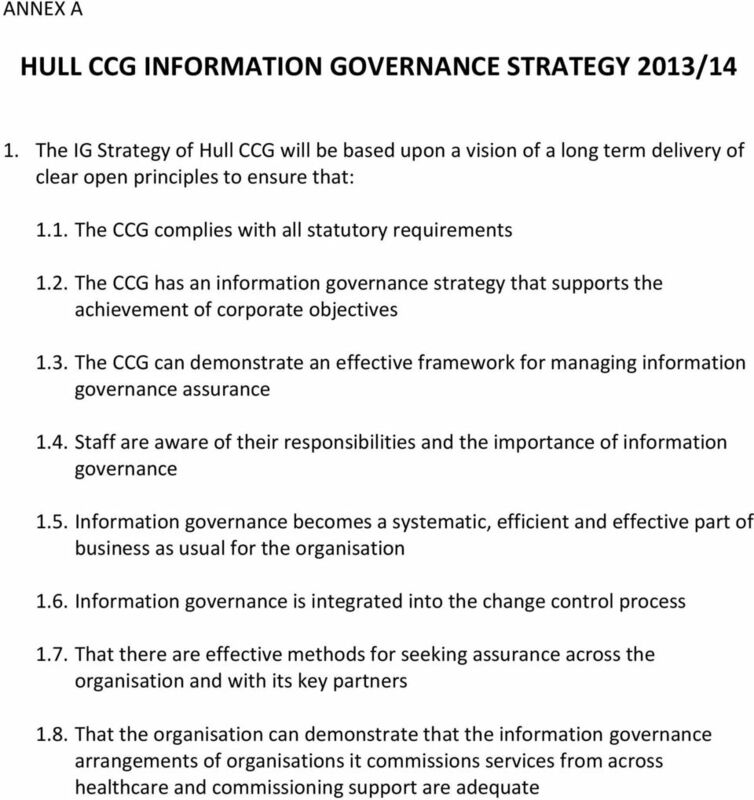 The IGG will provide assurance to the CCG Governing Body regarding Information Governance. 9 REVIEW DATE These terms of reference will be reviewed after 12 months.